Good morning everyone! It’s been over 2 years since I last posted, but I’m ready to get back into doing what I Love and that’s writing about college basketball. Yes, I realize March Madness is right around the corner and I’ve literally missed writing about the entire regular season. But, I can’t think of a better time to pick back up! In case any of you are wondering it’s been a wild 2 years. Last January (2013) I left for Marine Corps bootcamp, followed by combat training, and eventually landed in California. (due to security and force preservation reasons I shouldn’t post my whereabouts here, if you really care it’s not that hard to find out lol) Since joining I’ve been pretty busy with my job, but I want to write while the opportunities are here! Before that I was working two jobs and sleeping literally 2-4 hours a day. I didn’t have much time to write….hahaha? This first post isn’t going to jump right in with my thoughts on the upcoming conference tournaments and who I think will win and why like I usually write about. Honestly, I haven’t had the opportunity to watch that many games up to this point. So, I thought to get the wheels rolling again I’d start a sporadic, yet personal series of stadiums (campuses) I really want to visit and watch a game. Heck, I’ll even throw in the opponent of the home team I’d like to watch, just for kicks. This stadium is at the top of my list. Not only does this stadium hold many interesting and historic values and stories but the atmosphere created by the fans, especially the student section, is remarkable. If you’ve read any of my past posts you’ll know I’m a Kansas Jayhawks fan. No, I’m not from Kansas, but I became a fan at a young age because I liked their mascot. I was kid, what did I have to go off of? The Phog was opened in 1955 and Kansas’ already rich history has grown substantially in Phog Allen Fieldhouse. ESPN has rated The Phog as the loudest college basketball stadium in college basketball. Who wouldn’t want to witness that? 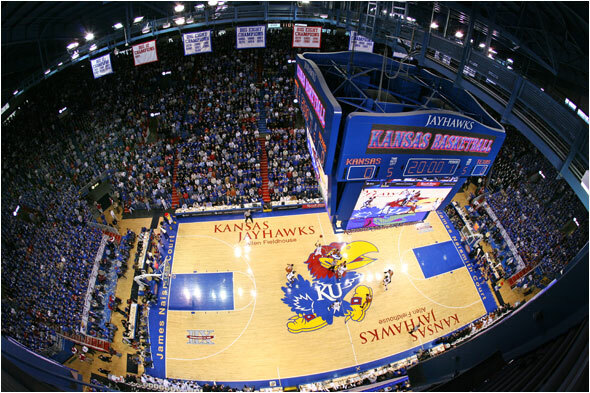 The “Home-court” advantage the Kansas Jayhawks feed off of is hard to ignore. Kansas is the second most winning-est team in college basketball, behind Kentucky. Kansas also holds some of the longest home winning streaks in the nation. Phog Allen Fieldhouse is dedicated to Dr. Forrest C. “Phog” Allen. Allen coached the Jayhawks in the early 1900’s for 39 years. Allen also played for the Jayhawks under James Naismith, aka the creator of basketball and the only KU head coach with a losing record, Ironic? Being the history nerd that I am I would love to visit this arena and learn everything I could about it and the tradition that continues to collect outstanding high school recruits such as Andrew Wiggins, and posts impressive season after impressive season. If I had the choice of who I could watch Kansas play in Phog Allen I’d definitely have to go with the Texas Longhorns. Kansas has a few rivalries to talk about. Such as, Kansas St. and Missouri (If you still call Missouri a rivalry after leaving the Big 12). The Texas vs. Kansas games are always a must watch for me. Some of the best games I’ve ever watched were between these two teams and I can’t think of any other team I’d want to watch play against the Jayhawks in Phog Allen. There would be almost too much rich history in one building to handle, but it would be an experience of a lifetime! I’m keeping this post short and sweet. Don’t want to get too lengthy and lose potential followers! Plus, this is simply a bucket list of places I want to see college basketball played. I enjoy interaction with my readers so I’d really like to hear from all of you! Leave a comment on where you’d like to see a game and who the home team would be playing if you could choose any team. Thanks for reading and look for new posts to come soon!